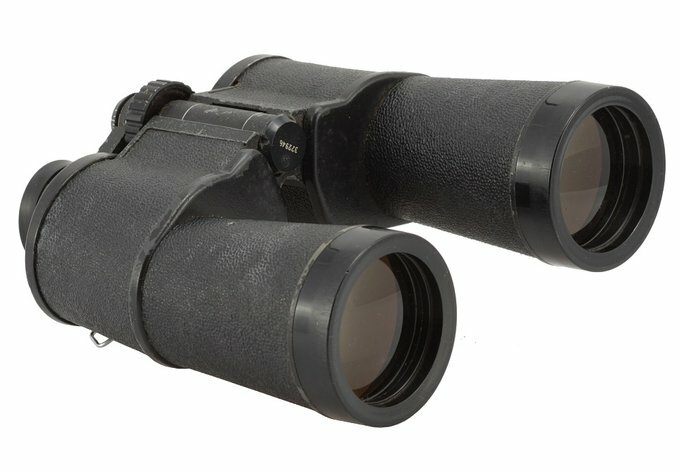 Legendary binoculars – the BPC Tento 10x50 - BPC Tento 10x50 - AllBinos.com . 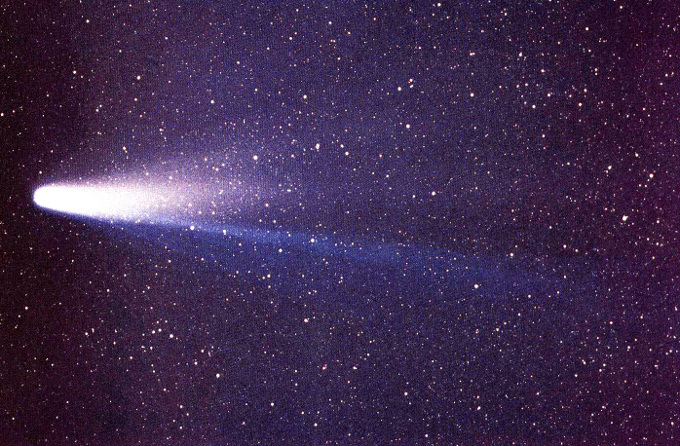 Halley’s Comet, officially designated as 1P/Halley, is, undoubtedly, one of the most well-known short-period comets. It visits the inner Solar System and the Sun’s proximity every 75 years. Currently it is approaching its aphelium (a point at which it is the furthest removed from the Sun) and it is going to reach it in 2024. In 1985-86 it was visible to the naked eye from Earth for the last time. Unfortunately that return was also the least favourable when it comes to geometric conditions in the last 2000 years. As a result the comet’s maximum brightness was just about 3 magnitude and only when it was visible on the southern part of the sky. Night sky observers in Poland could count only on 5-6 magnitude which meant the comet was barely discernible by the naked eye. In order to enjoy your observation you had to buy a pair of binoculars. Halley’s comet in 1986. Source: Wikipedia. In the middle of the 80s of the twentieth century I was a primary school pupil, not yet interested by either astronomy or photography. Still the flyby of the Halley’s comet was such an interesting phenomenon that it couldn’t be ignored, especially as the information about it was available in all the media, with the emphasis on the whole armada of space probes, sent to meet and study the comet. My dad was interested in astronomy and the return of the Halley’s Comet intrigued him very much. Having access to ephemerides, he was aware that in Poland the comet wouldn’t be an especially spectacular event so he started to think about an appropriate observational instrument which would make the observation more interesting. 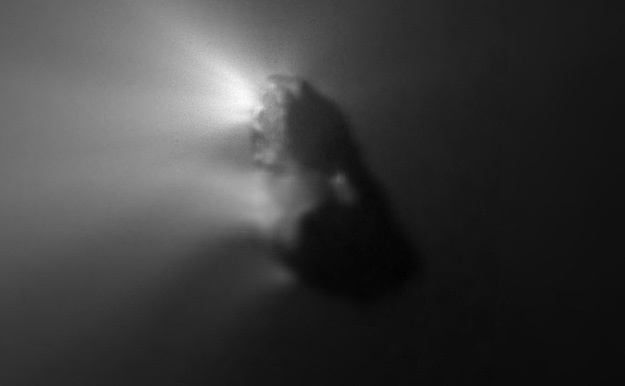 Halley’s comet nucleus photographed by the Giotto space probe during the 1986 flyby. Source: ESA. He could choose the Maksutow T50×70 telescope, produced by PZO (Polskie Zakłady Optyczne/Polish Optical Industries), a device we could borrow for short periods of time. Its main mirror diameter was 70 mm and the focal length amounted to 765 mm. Two eyepieces, allowing 50x and 92x magnification, were part of the set. It was a well-done device but, because of its narrow field of view, not especially suited for observations of bright comets. I don’t remember whether the binoculars arrived too late or the weather was poor or we just lost the dedication; anyway we failed to observe Halley’s comet through it. When in 1987 my astronomical passion erupted I promised myself that the pair of binoculars would be put to good use and I would wait for the return of the Halley’s comet in 2061. 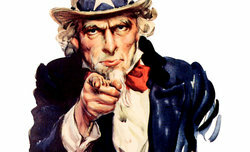 I still trust that the progress of medical science will allow me to do so even though in that year I will be almost 90. Anyway keep your fingers crossed for me! At first I didn’t keep that promise because I was too much into photography at that time, my second big passion. Instead of using the gifted pair of binoculars I spent most of my time in the local Community Centre, using its darkroom, developing classic ORWO analogue films or forcing Fotopans HL 400 ASA to speeds several times higher so they were more suited for astrophotography. The scout’s astronomical camp organized in Frombork in 1989 was a kind of a breakthrough for me. It was the second camp I attended but the former one, organized in August 1988, I spent taking photos. With an access to advanced equatorial mounts and telescopes produced by Zeiss such as the 100/1000 refractor or the 150/2250 Meniscas I simply had to get more engaged. Of course at that time I didn’t even dream of observing comets or meteors, a hobby which captivated my imagination one year later. It was a bit due to the fact that in those time an average astronomy fan could either buy the small Maksutov produced by PZO or could make a Newton construction of their own. The access to Zeiss-produced wonders from the People’s Astronomical Observatory on Żurawia Góra next to Frombork was like a dream come true and I had to make the best of it. During 1989 summer holidays my astrophotographic passion was already a bit satiated so I started to listen to dr Marek Muciek from the N. Copernicus University in Toruń more carefully. As a coordinator of the PTMA Comets Observers’ Section he encouraged everyone to tackle that topic. I found out my a bit dusty BPC 10×50 is simply a perfect tool for observing bright comets and an opportunity to use it in practice was coming very soon. In August and September the same year another short-period cosmic object belonging to the Halley –type comet family, the 23P/Brorsen-Metcalf comet, was supposed to have a flyby over our country. Its orbital period amounts to 70.5 years so waiting for the next chance seemed rather risky. I decided I wouldn’t let that opportunity pass by. Still it wasn’t easy, mainly due to the fact that the comet played a trick on its observers. 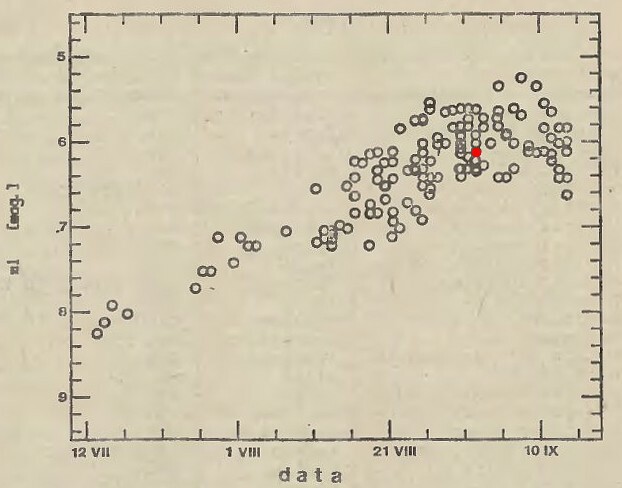 Before 1989 only its two flybys were documented so the number of observations and their precision weren’t exactly great. Despite these difficulties David Yeomans made calculations and presented an ephemeris according to which big telescopes of that day should have located the comet already in early spring 1989. Unfortunately nobody informed about such observations. The comet became visible only at the beginning of July and in a distance differing by 15 degrees from the designated place. The differences didn’t mean Yeomans made a mistake because the comet followed exactly the calculated path, but there were non-gravitational effects at play which meant the comet exceeded its scheduled ‘timetable’ by almost two weeks. The Brorsen-Metcalf comet action was the first done by the SOK PTMA after its reactivation and the surprise sprung on us by the comet complicated the matter a lot. All ephemerides and maps sent to the observers could be torn and thrown away. Keep in mind the fact I am talking about a pre-Internet era when all messages had to be sent by ‘snail mail’. It meant that weeks passed from first observations, performed in July, and comprising a new ephemeris which was sent via a telegram of International Astronomic Union, to making, printing and sending new maps; most of observers got them well after 20th August. During previous nights they were looking for the comet in vain because they were looking in the wrong place. Additionally, the new comet path was even less advantageous for Polish observers than the old one. As I’ve already mentioned that time I was determined not to repeat my Halley’s Comet fiasco. I wanted to use the beginning of September when the comet was supposed to be at its brightest. The object was supposed to be visible early in the morning; fortunately the first September weekend was also the second and the third day of that month, making summer holidays a bit longer. 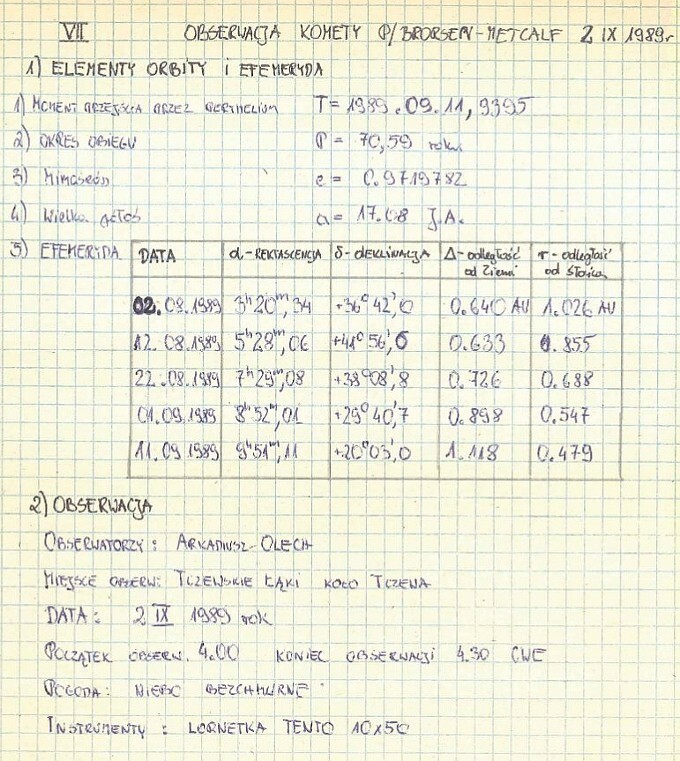 At that time I lived in Pruszcz Gdański, only 10 km from Gdańsk heavily polluted by street light, hardly an ideal place for astronomic observations. To improve the observation conditions I decided to visit my grandparents who lived in a village called Tczewskie Łąki. The night between 1st and 2nd September was cloudless. I got up at about 3 a.m. and prepared myself for observations. I had a map and the Tento BPC 10×50 binoculars close by and ready. From 4.0 a.m. to 4:30 a.m. I managed to notice a blurry spot exactly in the place indicated by new ephemerides – it was the first comet observed by me in my life, the main object of my interest that night. Its apparent magnitude I assessed as 6.2. Below I present the notes from my observation diary with the map and the position of the comet. A fragment of the observation diary of the author of this article from the night between 1st and 2nd September 1989. 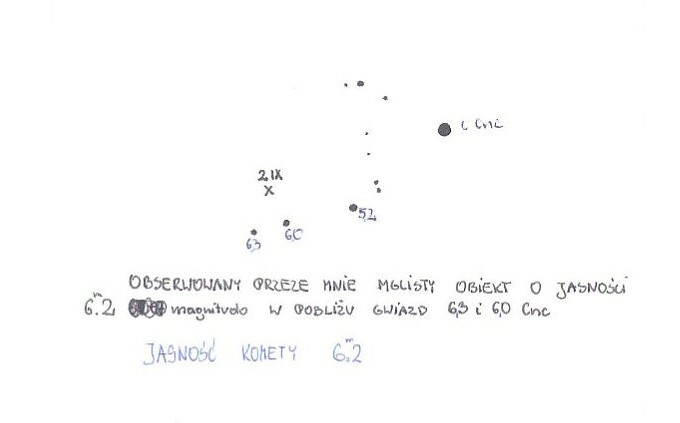 A sketch of the Brorsen-Metcalf comet position and the position of close stars during the 1st/2nd September 1989 night observation performed by the author of this article. Several months later the SOK PTMA coordinators sent a summary of the Brorsen-Metcalf comet action to all observers. It ensured me personally that my first ever comet observation was successful; I could even compare my results to observations of other participants. The Brorsen Metcalf comet light curve graph according the SOK PTMA observations. The red dot indicates the result got by the author of this article. The light curve includes all observations performed by the SOK PTMA observers. The red dot indicates my result. As you can notice it fits the trend and seems to be just slightly lower than the average apparent magnitude, amounting to about 6 that night. Taking into account my debutant fright and the fact that visual observations come with a measuring error of 0.1-0.3 mag I suppose it was a completely satisfactory result. I enjoyed comet observations very much and soon I became a real fan. As the following years didn’t lack of bright celestial phenomena I soon could boast of several dozen observation nights under my belt, capturing such objects as the Austin and Levy comets. All that time the inestimable Tento 10×50 was my faithful companion and in 1990 it got a friend in a form of the bigger 20×60 model. Forgive me such a long and personal astronomical and historical digression but I feel it justifies the idea behind this article. The fact is that the Tento BPC 10×50 binoculars can hardly be compared to other models presented in our ‘Legendary binoculars’ cycle but for me personally it is a truly legendary device. After all it is my first pair of binoculars which nourished my photographical and astronomical passion. I suppose plenty of people born and bred in the Eastern Bloc countries would agree with me. Let’s progress now to a short presentation of the main character of our article. At the very beginning we should perhaps clarify the name of this pair of binoculars. Many people tend to think that Tento is the name of the company and BPC is the name of a particular model. It is not exactly right. The shortening BPC stems from the Russian БПЦ (бинокли призменные с центральной фокусировкой) so binokli prizmienne s centralnoj fokusirowkoj. It means just a pair of binoculars with central focusing. The word ‘Tento’ also doesn’t mean a model type or name as it comes from the word Technointorg, a Russian Ministry (Office?) of Foreign Trade which dealt with selling Russian optics abroad (meaning outside the Soviet Union before its disintegration). The main supplier of Technointorg products were Zagorsk Optical-Mechanical Plant (Загорский оптико-механический завод, ZOMZ) placed in Sergiyew Posad, 70 km from the centre of Moscow. As it is a well-known Russian factory which constructed many good quality models of binoculars perhaps we should say something more about it. A decision to build a Soviet factory which would produce optics instruments of different kinds was taken in June 1934 as a part of the second 5-year plan. The decision was implemented very quickly because already in September 1935 the first pilot plant was created and in April 1936 the first instruments, Brinell microscopes, were produced. In 1941, after the Nazi III Reich attack, the ZOMZ industries were moved to Tomsk as German armies were approaching Moscow. In 1942 there was already a full scale production of optical instruments for the Russian Army. In summer 1943, when the Germans withdrew, the industries returned to Sergiyev Posad. 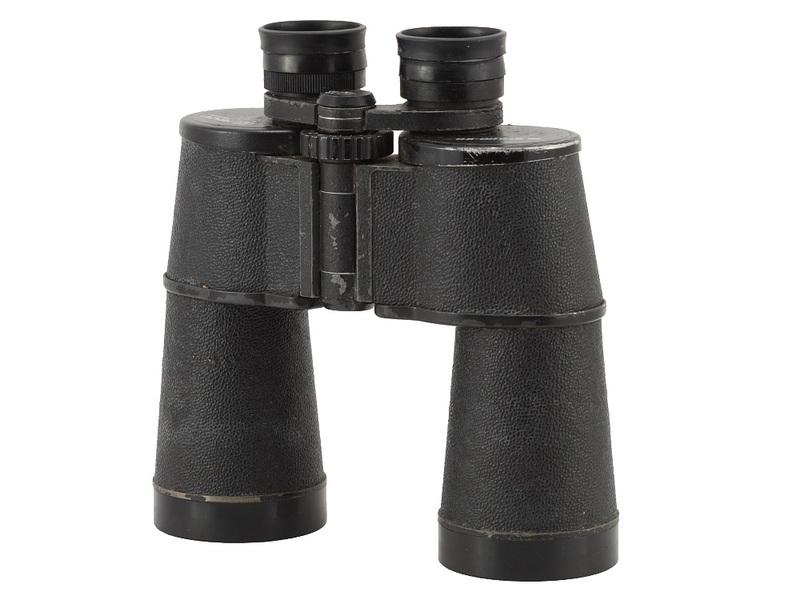 The ZOMZ produced first civilian pairs of binoculars in 1947 – it was a theatrical 2.5×24 model. In 1951 two other prismatic 3.5×15 and 6×18 instruments were released. 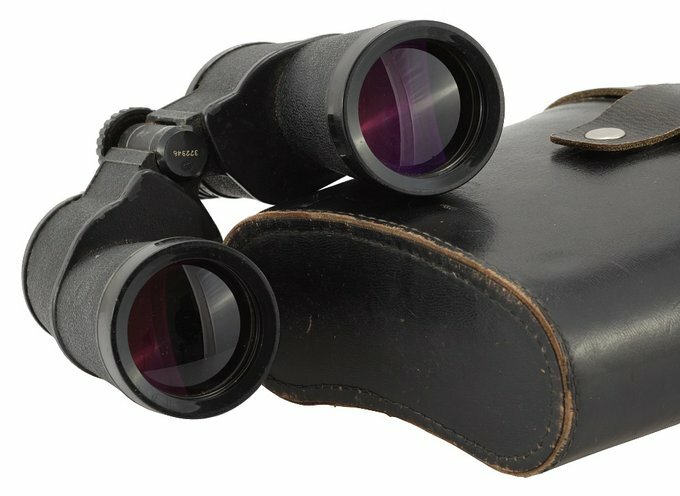 The project of the BPC Tento 10×50 binoculars, described in this article, was designed near the end of the 60s of 20th century. First specimens which looked exactly as the one my dad bought me in 1986, appeared at the beginning of the 70s. 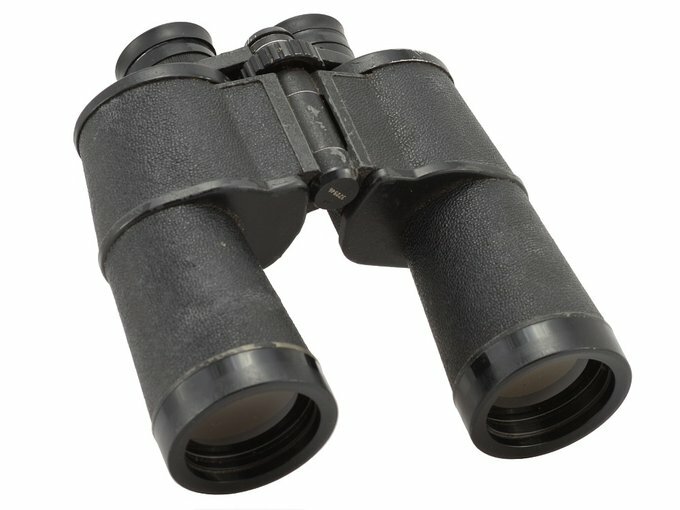 In the middle of the 80s these were binoculars found most often in Polish shops. It doesn’t mean they were available all the time, quite the opposite; even though they cost as much as half of average monthly income of that time they were never easy to get. The optical construction of the Tento BPC 10×50 couldn’t be more classic. You deal here with an achromatic objective lens, a glued doublet, BaK-4 Porro I prisms and a 3-element 2+1 eyepieces. The specimen I own also features characteristically purple one-layer magnesium fluorite coatings. The apparent field of view is hardly impressive as it amounts to 5.4 degrees (95m/1000m) and the eye relief distance can hardly be called comfortable as it is just 11 mm. To be honest, by contemporary standards this piece of binoculars can’t surprise you in a positive way. The image comes with strong yellow tint, the field of view, even if not the largest, is not corrected properly on its edges, featuring wide blurry areas and aberrations. The 10×50 instruments produced at the same time in Zeiss factories in Jena (the Dekarem 10×50 and the Jenoptem 10×50) were better from practically every aspect. Of course they also were more expensive and far more difficult to get so the Tento used to be the only choice you had in Poland; mind you at that time Polish Optical Industries (PZO) didn’t have a 10×50 instrument in their line-up. 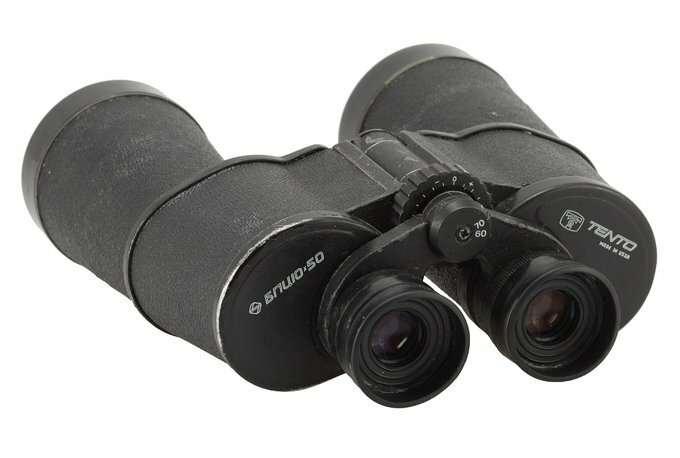 The transmission graph of the BPC 10×50 model, shown above, explains why the image provided by this pair of binoculars is so yellow. The more or less flat transmission can be observed only in the range from 560 to 800 nm. Below 560 nm you see a very distinct drop so there’s a slight shortage of green light, a significant shortage of blue light and huge shortage of purple light. The highest values which are still on a very mediocre level of about 76% you get in the 560-620 nm range so exactly in a place where yellow-orange light dominates. Magnesium fluoride coatings mean the loss of light on one air-to-glass surface decreases from less than 5% to about 1.5%. The BPC Tento 10×50 features 10 air-to-glass surfaces (two on the objective lens, four on air spaced prisms, four on the eyepiece). It means that the maximum transmission should be around 85%. The result of 76% is noticeably lower. The glass absorption should be blamed for only one part of that loss and it seems the main culprit is the age of the binoculars and, stemming from it, the wear and tear of antireflection coatings. When it comes to the casing it is made of metal and padded with characteristically textured leatherette material. The binoculars feature a classic ocular bridge and a dioptre adjustment on the right eyepiece, ranging from -3 to +3 dioptres. Eyecups are made of rubber so they could be folded – a recommendable solution for people wearing glasses. Buyers got a hard case made of leather with a strap, a quite thin strap for the binoculars themselves, four protective caps and yellow-green filters which, taking into account strong yellowish tint provided by the optics itself, were a kind of practical joke. There were two strong advantages of the BPC Tento 10×50: solidity and simplicity of build. The specimen I own has never been collimated because, despite almost 30 years of wear and tear, it’s never needed it. The focusing ring still works properly well. The only flaw, apart from a noticeably worn casing (quite understandable, after so many years) are slacks on the bridge – after every move the distance between the tubes changes. It’s worth adding that the model, described here, was changed and improved later (at the turn of 80s and 90s of the previous century). 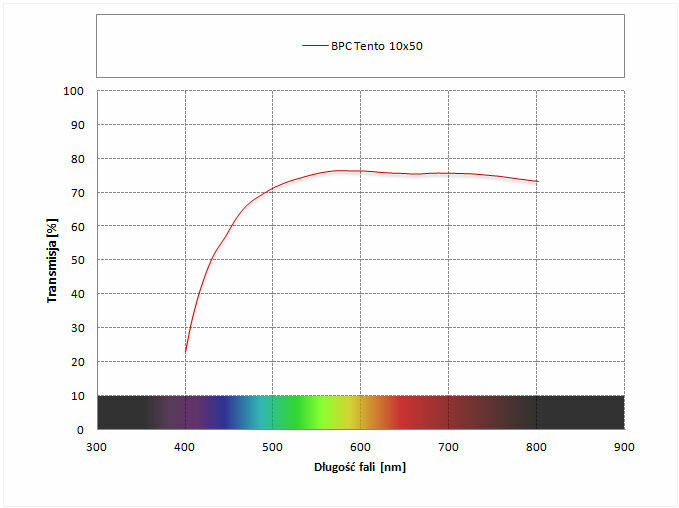 The new Tento BPC5 10×50 had a field of view of 6 degrees and its eye relief distance amounted to 15.3 mm. Its appearance also changed, becoming more similar to Jena products, with shorter tubes of objectives and longer prism housings. Additionally the coatings had a different colour, suggesting more than one layer. 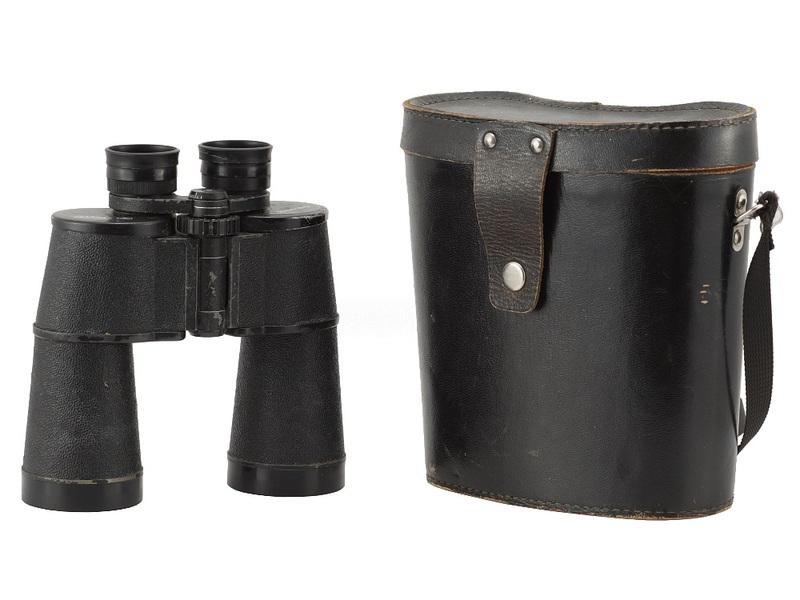 Many generations of passionate observers living behind the Iron Curtain were using different BPC binoculars, especially the 8×30, the 7×50 and the 10×50 models. I am sure many of those who are now close to my age or older will agree with me: for us the BPC Tento 10×50 is and will remain a legendary, cult model.